Glendon came into our program in 2006 and was fostered by Mindy and Brian Dicken. Mindy and Brian thought Glendon was a wonderful dog, but they let him go into a home when an adopter was approved. Glendon spent very little time with his new adopter. He suffered from severe separation anxiety which brought him back to Mindy and Brian. From the moment Glendon walked back into their home, Glendon showed them without a doubt that his home was to be right where he was. He settled in and never had a bit of anxiety from that moment on. Glendon was a dog that knew what he wanted. 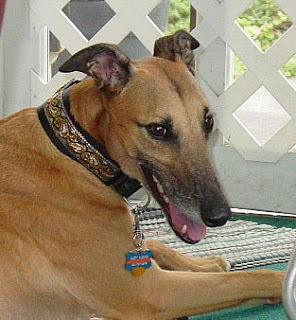 Glendon was part of a busy and active family with children, four other greyhounds, cats and a Great Dane. It’s where he flourished. Recently, Glendon started limping and within a very short time he was in a lot of pain. A vet visit revealed that he had cancer and it was in a location where amputation would be almost impossible. The cancer was advanced to the point where the only option was to put Glendon on pain medication. Mindy and Brian made the heartbreaking but unselfish decision to let Glendon cross the Rainbow Bridge. We are sorry that Glendon did not live a long life with Mindy and Brian. But we do know that he lived the best life possible where he had lots of love and companionship. Glendon will be sadly missed by the Dicken family. I knew that by “being owned” by 5 greyhounds – cancer was sure to take the life of at least one of them. That is the chance we take when we make the commitment to allow these beautiful creatures into our lives and into our hearts. I have to say though, that even KNOWING this does not prepare you for the heartache you feel when that special “light” leaves this world. Hettie was so correct when she said Glendon chose his home. He was SUCH a wonderful boy! He was one of our first fosters, and was placed into what was supposedly a “greyhound-savvy home”. It was not but a couple of weeks before the person I adopted him to called me to say I was to “come and pick him up, because he was destroying her house”. I didn’t want Glendon to be with this person for one more minute, so I immediately went to pick him up. When I got Glendon back to our house, he walked in – and went straight to the crate he had been using when he was here – and just laid down and sighed a sigh that sounded like pure-relief! He was “home” – and I could physically see he was happy and content to be back! I spoke to Hettie, and when she heard this, she was more than happy to allow us to keep Glendon and give him the love he deserved! From that point on, Glendon spent his time lounging and relaxing! He never showed ANY of the so-called “separation anxiety” that he was bounced for! He has happy and content – and was so very attuned to “his people”. He was sensitive to MY emotions – and when I was upset, HE would be RIGHT THERE for me! I loved this dog so much – and he brought me so much joy. When the vet said cancer – and that it was “high” and “involved arteries” – we knew we could not be selfish and make a dog that brought us so much joy suffer for even ONE more night. We made the decision right then to let him go to the bridge with dignity. Although it was hard for us, it was very easy and peaceful for him. He is now “zooming“ with the grey’s who went before him – with no boundaries and no fences! He can run anywhere as fast as he wants to run, and when he is tired, he is now able to “roach” (he was a BIG roacher) on a soft, fluffy cloud. It is so nice to gain friends when you adopt these special dogs – and that has been one of the BEST parts of being involved with Fast Friends Greyhound Rescue… the fact that we have been able to share our joy with so many other people. Hettie and Bill allowing us to have a hand (and heart) in the adoption process for others – and allowing us to bring these special dogs into the lives of others, has enriched our lives forever.